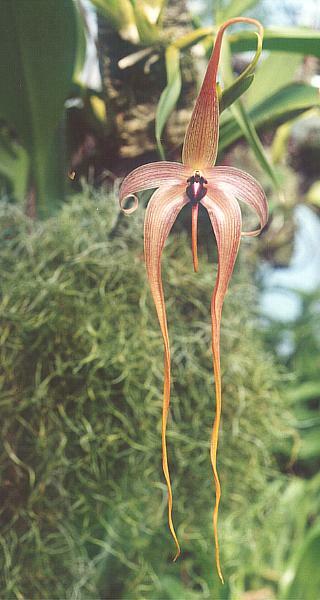 Bulbophyllum is the largest genus in the orchid family Orchidaceae. Numbering more than 2,000 species, it is also one of the largest genera of flowering plants, exceeded only by Astragalus. The center of diversity of this genus is in the montane forests of Papua New Guinea (containing more than 600 species), which seems to be the evolutionary homeland. 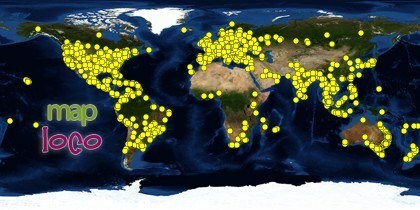 On the whole, the genus is pantropical and widespread, occurring in Australia, Southeast Asia (with over 200 species in Borneo), India, Madagascar (with 135 species, some endemic), Africa and in tropical central and South America. 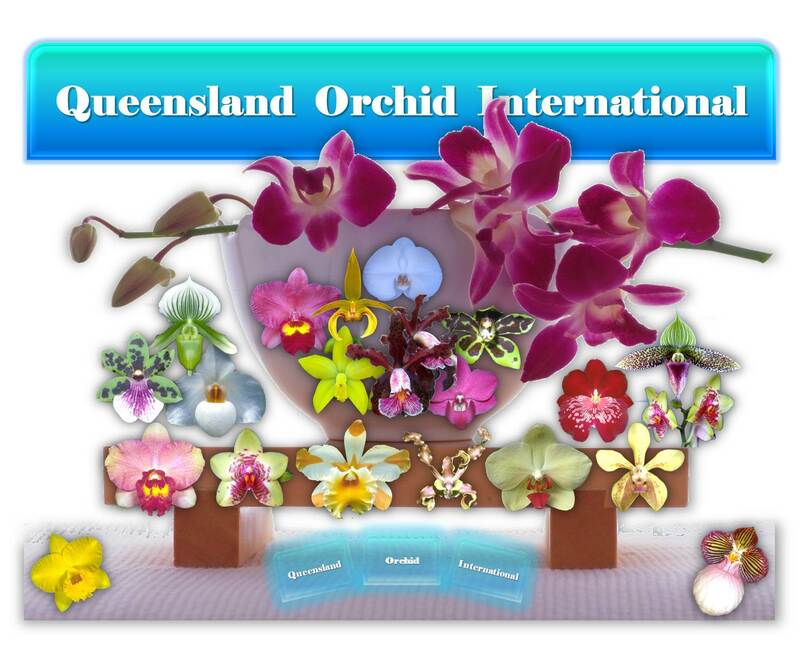 The fabulous and bizarre species that comprise this large genus have been the focus of orchid collectors for over a century. The plants require high humidity combined with good air movement and most of them are ever-blooming – flowering continuously throughout the year. They grow best at moderate light levels, but do not in deep shade. They are considered moderate to difficult in cultivation, and require a controlled growing environment to achieve some degree of success. They are not typically suitable as houseplants, and most will not thrive in a wardian case unless they receive adequate air movement. 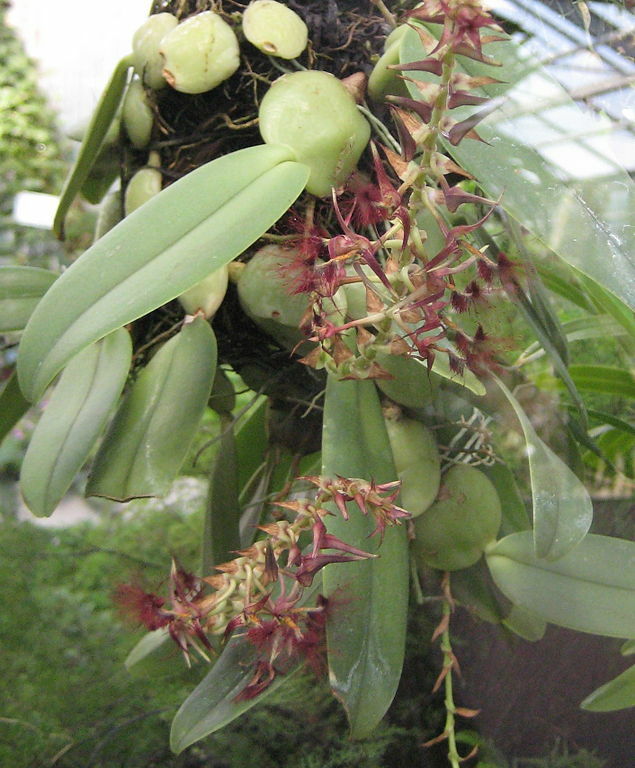 The plants’ growth habit produces widely spaced pseudobulbs along cord-like rhizome sections, and most of these plants are best accommodated on plaques. 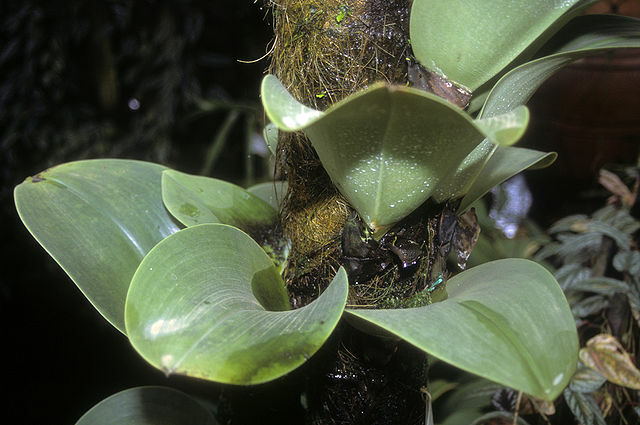 Some species in this genus can get very large, but most are small to medium-sized epiphytes from warm, moist, humid tropical forests. They can grow continuously year round with no apparent dormancy period if they are kept warm, are moderate feeders in cultivation, and must be kept moist all the time. They can tolerate dryness for short periods, but they have fine root systems which require moist conditions all the time. The flowers produce various odors resembling sap, urine, blood, dung, carrion, and, in some species, fragrant fruity aromas. Most are fly-pollinated, and attract hordes of flies. 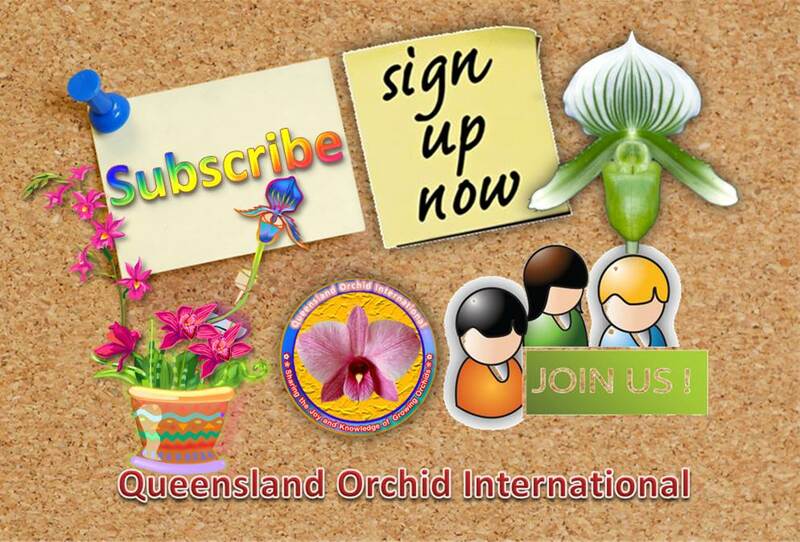 Excellent or exceptional photos and videos uploaded to the group may be featured in the following Gallery of this post to provide exemplary visual documentations of The One Thousand and One Faces of Bulbophyllum. 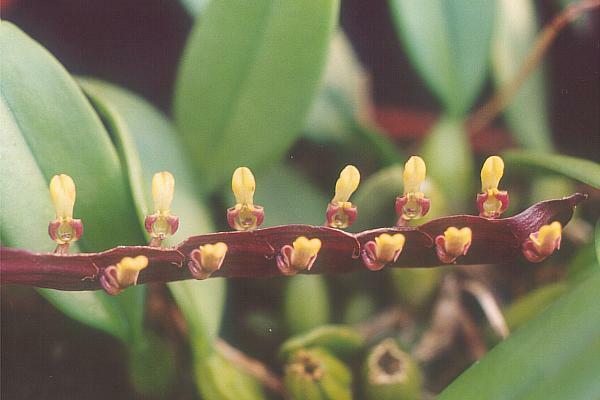 Bulbophyllum beccarii creates its own compost bins and soil buffets with its cup-shaped leaves. It has flowers that smell like rotting fish or “100 dead elephants rotting in the sun”. Found in Borneo in lowland and peat swamp forests at elevations of sealevel to 600 meters as a medium sized, hot to warm growing creeping epiphyte that wraps around the trunk of a tree with ovoid, pale yellow green pseudobulbs carrying erect, oblong to broadly elliptic, obtuse to acute, thick, leathery, reticulate patterned, sulcate, gradually narrowing below into the petiolate base leaves held in a cup shape trapping all the falling deitrius from the tree and is invaded by a tangle of roots. The flowers are beautiful, occur in the spring and summer, hanging in a pendant, 5 to 17″ [12 to 43 cm] long, densely many flowered cluster below the base of the leaf, yet smell like rotting fish or meat. The rosy with violet lined peduncle is enveloped by 5 imbricate, ovate to ovate-elliptic, acute to acuminate, dorsally carinate bracts and has flesh-colored with darker pink to purple flecked, lanceolate, acuminate, floral bracts. 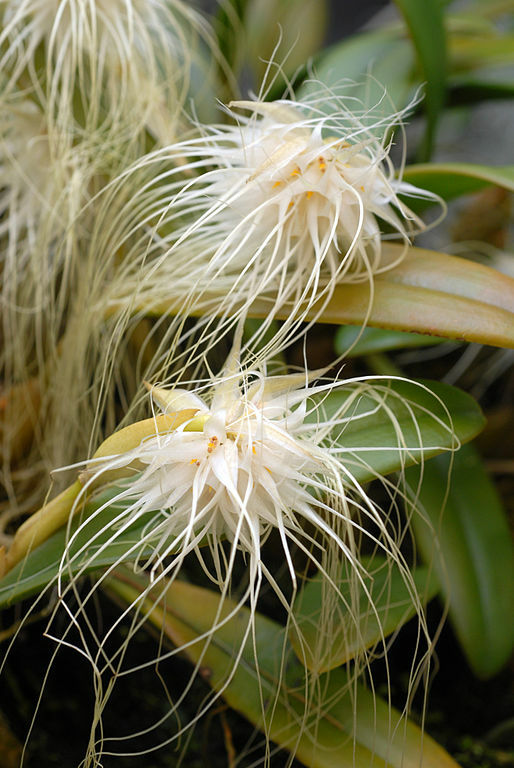 According to Michael Angel Morales LLuch: Has also been called the Coconut Bulbophyllum (referring to the scent of the flowers). Small flowers, flower Size .8 to 1″ (2 to 2.5 cm) Native Habitat is Africa, in Sierra Leone, Ivory Coast, Liberia, Ghana, Gabon, Gulf of Guinea Islands, Cameroon, Central African Republic, Zaire, Angola and Uganda in lowland and montane rainforests at elevations. If I hadn’t looked it up I thought it looked like a dendrochilum!